Los Angeles is not all mini-malls and highways. As Eric Garcetti, president of the City Council, shows, it is eminently possible to live green in the City of Angels. By putting solar power and recycled materials to use, he and his partner transformed a mid-century house on a cozy hillside plot into a sustainable home with garden terraces and panoramic views. The home doesn't hide its extensive renovations: with all-new windows, installed to maximize both views and solar exposure, it is quite visible where old meets new. Eric Garcetti's 11-year-old Toyota Rav4-EV sits in front of the house, awaiting its next electric fill-up. Garcetti cleans up the rooftop array of solar panels. In the foreground, hidden beneath trees and greenery, is the couple's garden. Amy Wakeland prepares some of the fruits and vegetables that she regularly harvests from the backyard garden. The dining room. Much of the furniture was purchased from vintage modern home stores in L.A. The furnishings represent an attitude—whenever possible, recycle, reuse, and support local manufacturers—as well as a strong sense of aesthetics at home. By eliminating the drop ceilings, the architects opened up the ground level, which had been broken up into several rooms. This not only revealed the original beams, it also brought a much more expansive sense of space. They lengthened the kitchen by removing a ground-level bathroom. This created a much larger kitchen/living/dining area, complete with a central fireplace. An outdoor water feature adds a subtle soundtrack to the property while keeping the plants irrigated. The broad deck and seating area are perfect for the Mediterranean climate and invite guests outdoors. Wakeland goes to work on the garden terraces where the couple grows much of their own food. 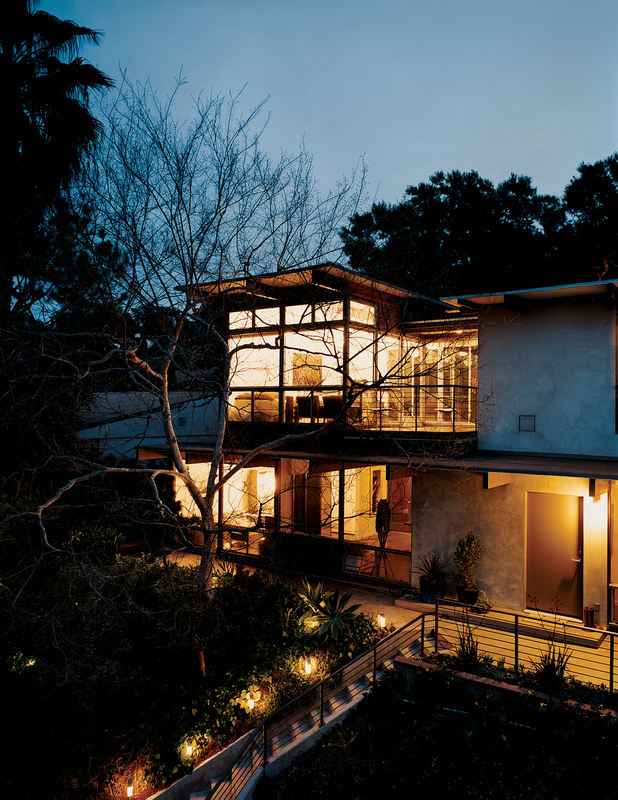 The second-floor deck looks out onto the green canopy of Garcetti and Wakeland's neighborhood and indoors to a pair of Vatne Møbler rosewood lounge chairs. A well-placed writing desk takes advantage of the view. The bathroom includes a walk-in tub. Garcetti and Wakeland enjoy a quiet afternoon, sitting in what used to be two separate bedrooms. By removing a wall, the space now serves as an office and den, divided only by sliding doors. Garcetti, 37, is an engaging and smart young legislator who, together with his equally dynamic partner, Amy Elaine Wakeland, 38, has been active in progressive politics since they met as Rhodes scholars at Oxford University in 1993. Garcetti is currently the state co-chair of Barack Obama’s presidential campaign, while Wakeland is hard at work fighting for the expansion of public parks in low-income neighborhoods. But if their first love is political action, they also share an interest in design, and they’ve spent several years adapting and landscaping a mid-century home in the neighborhood of Echo Park, near downtown Los Angeles. As I drive to their house to pay a visit, I ponder what to expect. Do Garcetti and Wakeland practice what they preach? Is Garcetti’s home life as green as the legislation he promotes? Their home is perched on a very steep hill, overlooking the small houses and apartment buildings that cling to the slopes of this ethnically—and economically—mixed neighborhood. There, parked in the driveway, is a silver Toyota RAV4-EV. Garcetti has been driving an electric car since GM released its leasable EV1 in 1997; in fact, he was featured in the documentary <i>Who Killed the Electric Car?</i> as one of those fighting to stop GM from killing his car. Garcetti and Wakeland’s house was designed in the early 1950s by architect Daniel Dworsky, the founder of a large corporate firm whose projects include the Bradley International Terminal at LAX. It doesn’t scream “classic high modern” in the sense of a Neutra or an Ellwood; rather, it’s a simple post-and-beam building in olive-gray stucco with large metal-framed windows. It evokes the pleasantly imperfect quality of a lived-in house that has weathered multiple owners and add-ons. When Garcetti and Wakeland bought the house, they wanted to emphasize its modernist characteristics while bringing it into the next century. With the help of architect Elissa Scrafano, the structure is now a study in openness, simplicity, and light, with the bonus features of sustainable materials and greater energy efficiency. The main objective with the renovation was to make the house as energy efficient and nontoxic as possible. The house does have air-conditioning, but they maximized cross ventilation by installing windows on all sides. They installed a tankless water heater and solar paneling on the flat roof, which provides 50 percent of their energy; they laid bamboo flooring on the second level, built closet doors of recycled plastic, and constructed decks out of sustainable wood treated with nontoxic sealant. No-VOC Yolo paints were used throughout the house. And, at around 2,000 square feet, they kept the whole project a relatively modest size. Not unlike the home itself, the furnishings embody livability rather than perfection. Several of the pieces are hand-me-downs from Garcetti’s parents. (Gil Garcetti was the district attorney for the City of Los Angeles and now photographs art, architecture, and cultural subjects; Sukey Roth Garcetti headed up a local charitable foundation.) 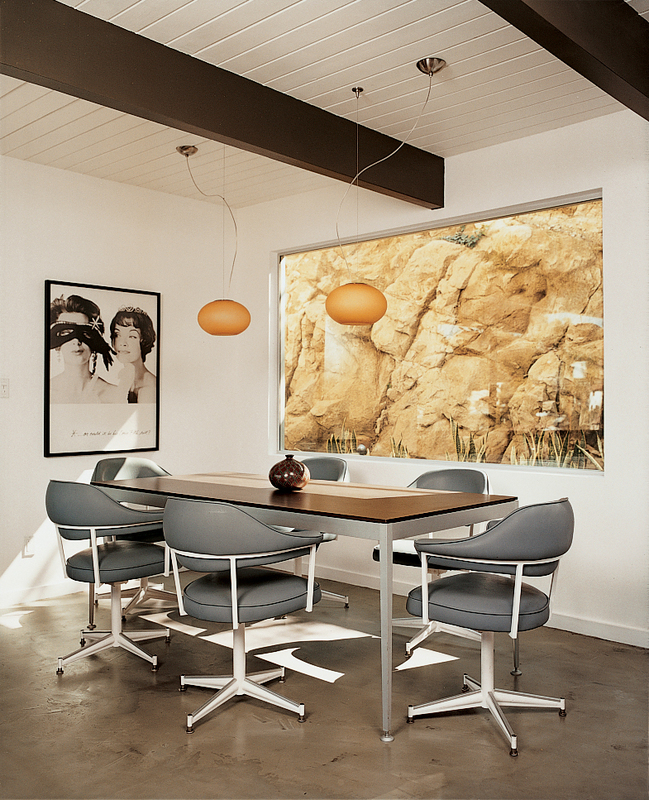 The family grew up in Encino in the San Fernando Valley, in a thoroughly contemporary home. “It was nice growing up with modernist parents,” says Garcetti, pointing out the metal dining chairs with vinyl padding which he used every day as a child. Everything about the house suggests that Garcetti and Wakeland more than practice what they preach; they are trying to channel into political action a philosophy of life that they have been honing for many years. Yet, the two are living an essentially suburban life, albeit as earth-friendly a one as possible. I ask them whether it wouldn’t be even more sustainable to reside in a multifamily dwelling in Garcetti’s district or downtown and walk or bus to City Hall. Both Garcetti and Wakeland say this is an issue with which they have grappled.